This week, Avant PR organised sweet treats to be delivered to the desks of selected press, on behalf of luxury beachwear brand Guilty Beach. Taking in to account the brand’s chic Summertime aesthetic, Avant and Guilty Beach decided on colourful cakes from Laura’s London, with simple bases and exotic flower tops and an on-brand gold topper with the Guilty Beach name, so there was no ignoring who had delivered such delicious treats. 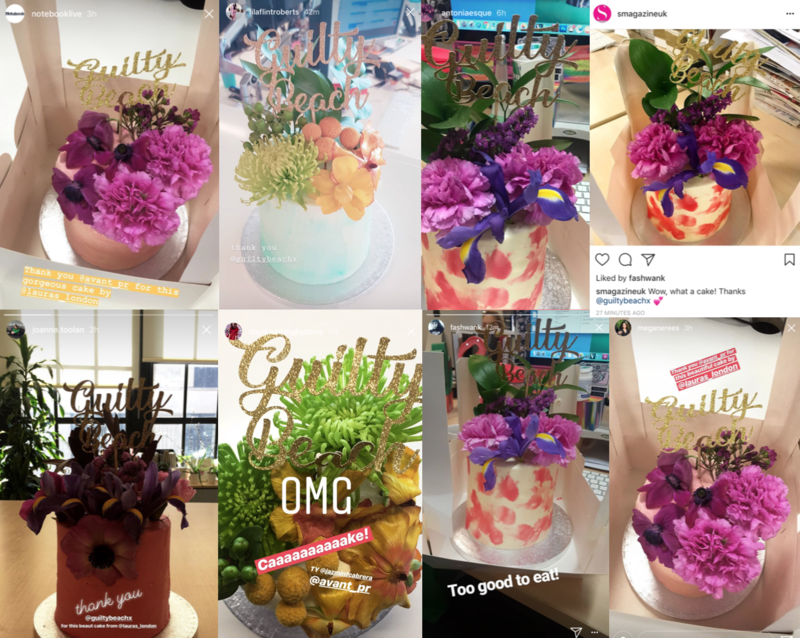 The cakes were packaged up with new season lookbooks from the brand and delivered to press’ desks on a Thursday afternoon, for a much-needed sugar boost. The social media response was overwhelming, with the likes of Sunday Times Style, S, You, Notebook and Fabulous all raving about the eye-catching deliveries. We only wish we’d had one delivered to our desks, too! Guilty Beach is a luxury resort wear/beachwear brand. The brand is made up of timeless designed pieces from hand beaded silk kaftans to cotton embroidered dresses.